Adi Shankaracharyaji, after having given all the knowledge he had to give he says one last thing, ‘O Shiva! You are me and I am You – Shivoham! 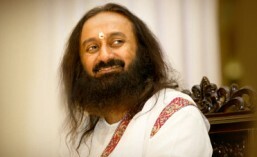 ’ (Shivoham – I am Shiva). Atmatvam – The Atman (Soul) is Shiva, and Girijimatih – Our buddhi (intellect) is the manifestation of Mother Divine (Devi). And intellect is of three types: Sattvik, Rajasik and Tamasik; which means that the intellect can be predominantly ruled by Satoguna, Rajoguna or Tamoguna. So in essence – ‘I am Shiva and my intellect is Sati (Mother Divine) Herself’. And life depends on how our intellect (mati) is. If the intellect is Tamasik then it becomes Kali (a violent form of the Mother Divine) and takes hold over Shiva (here, the soul) and works towards destroying everything. If the intellect is Sattvik then it takes the form of Saraswati (the form of the Mother Divine associated with knowledge and wisdom); and if the intellect is Rajasik then it is Lakshmi (the form of the Mother Divine associated with wealth and prosperity). So, as is the intellect so are the actions (Jaisa mati vaisa gati). As the nature of our intellect, so are our actions. You must have seen that there are some people who have a lot of negative feelings. They find fault in everything, and try to prove everything as faulty or incorrect. Even if someone is doing very good work, there also they will find some fault or the other. Such an intellect is destructive in nature – Tamasik intellect. A Rajasik intellect is one that wants – I want this and I want that as well, and so one engages oneself and others into activities to acquire this and that. A Sattvik intellect is one that is blissful, happy, contented, and intuitive; an intellect that is supportive of others, helpful to others, joyful, aware and knowledgeable. So, Gayatri (the primordial aspect of the Mother Goddess) means to go beyond, to transcend these three gunas (Tamasik, Rajasik and Sattvik). That is why we pray (through the chant of the Gayatri,) – Let this intellect be guided and inspired by something which is beyond the intellect – the Divinity. So we first relieve ourselves of Tamoguna, by engaging in the activities of Rajoguna, and then we relieve ourselves from Rajoguna, driven activities and move up towardsSatoguna. And then we go beyond even Satoguna to realize the bliss and peace of the supreme Consciousness – this isGayatri. That is why Gayatri is said to be the power that can destroy and overcome all sins and sorrows, and the chanting of which helps us overcome adversity, that is Gayatri. See, this is like a vicious circle. First we move (in a circle) from Tamoguna to Rajoguna, and then from Rajoguna toSatoguna. When we strive to hold on to the Satoguna, we come into Rajoguna. And if we strive more in Rajoguna, we again fall back into Tamoguna. So we climb up only to go down once again, and this keeps happening. The root cause of this is Aham (Ego), which is in the subtle form like that of an atom. By that we pray that may our intellect be freed from sins, criticism, and other negativity. That is why we have the japa(chanting) of the Gayatri mantra. So what is the best prayer? May this intellect of ours be inspired and guided to move on the path of righteousness! And we pray that this happens for everyone – ‘Nah’, which mean may everyone’s intellect be guided and inspired this way. If one person’s intellect goes in the wrong direction, and if you happen to be with that person, then his negative vibrations come to you too. How many people have had this experience? Raise your hands. If you sit day and night with someone who keeps speaking negative things, then your mind also becomes anxious and restless with that negativity. And then, as a result of that, you do not experience joy and happiness. That is why, we pray that may our intellect be inspired and directed to move away from all negativity. Bhargo Devasya Dhimahi means, May all our sins be burnt and destroyed. And so we pray to that Divine Power and Supreme Consciousness which is present everywhere to dispel and destroy all our sins, and guide and inspire our intellect on the path of righteousness. This is so beautiful, isn’t it? We must pray every day that only good things come to our intellect. It is like how we sing the song ‘Sabko sanmati de Bhagwaan’ – that is, we pray to God to give everyone a righteous intellect. So, may God’s divine radiance shine within us! This is what we should pray for. Whatever we think and pray for, that starts to happen.